African violets are one of the most popular plants in the country. Their popularity and ease of growth has led to the production of almost endless varieties of the plant. While a couple of varieties of African violet grow naturally to an extra large size, the biggest component to growing extra large African violet plants is how you raise the plants. By following specific techniques in potting and bud maintenance and keeping the plants at an optimal temperature, you can increase the size of standard African violets. African violets grow well when their roots are contained tightly in their pot. However, to increase the plants growth, you must allow room for new roots to grow and expand. Move your plant to a larger pot that won’t allow for the African violet to become rootbound. If the plant fills out the pot, move it again. To grow extra large African violets, you must remove the buds from the plant to allow the nutrients to be spent by the plant in developing new roots and leaves. Removing all of the buds will create the greatest growth results, but partially de-budding the plant will allow for both increased growth and flowering. Holtkamp Greenhouses suggests using a sharp knife to remove the bud and as much of the stalk as possible. African violets thrive in 65 to 80 degrees Fahrenheit. This temperature range allows for the greatest cell division, leading to growth. Below 65 degrees Fahrenheit, cell division almost stops, while above 80 degrees Fahrenheit, the cells begin to break down, according to the African Violet Society of America. The Optimara World Traveler series offers several individual varieties of African violets specially cultivated to reach extra large size. 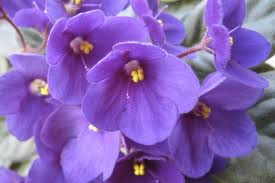 The strains were developed by Holtkamp Greenhouses, one of the primary cultivators of African violets. The Everlove variety of African violets also offers a naturally extra large plant. Even when growing a variety of naturally large size, following the above techniques will increase the plants’ growth. « Why Are My African Violet Leaves Wilting?